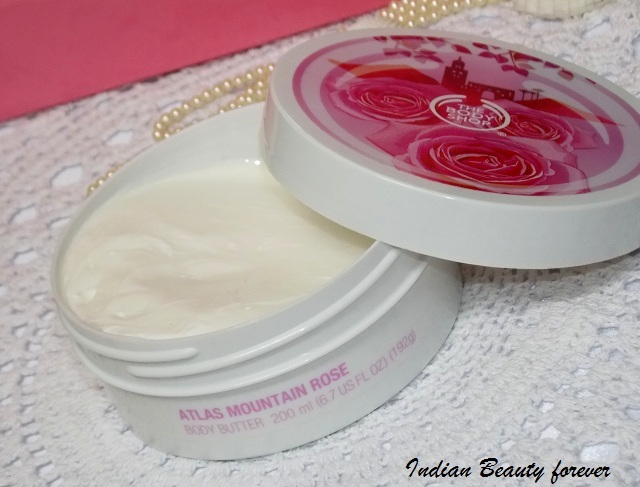 I will review The Body Shop Atlas Mountain Rose Body Butter. Body butters can be savior for dry, rough skin especially during the winters due to their rich, creamy and very moisturizing formula. I got this product 2 months ago and its fresh rosy fragrance has made me like it the first time I had used it! Apart from that The Body Shop has got plethora of body butters with some very good ingredient like the newly lauched Blueberry, papaya, almond, strawberry etc to name a few. 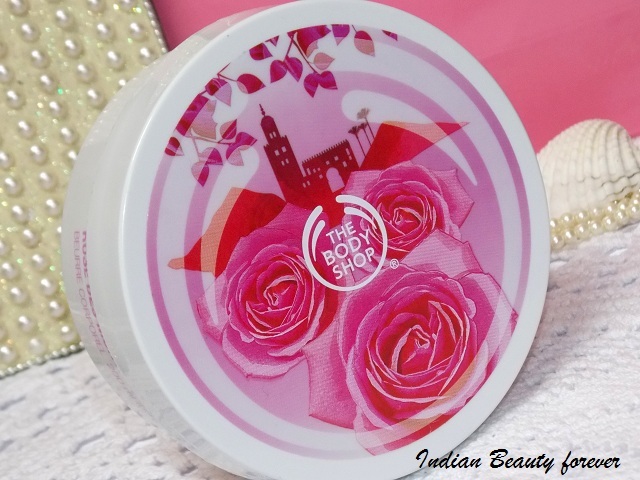 Price: The Body Shop Atlas mountain Rose body butter is priced at 1395 rupees for 200 ml tub and can be purchased from the outlets or online. 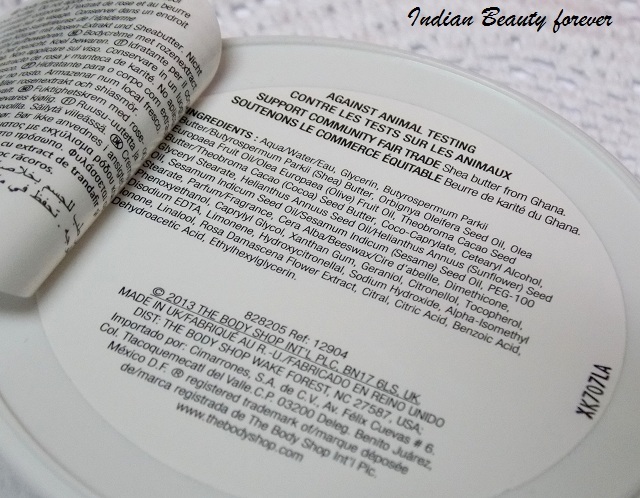 Most of the leading online shopping sites do stock The Body Shop products! 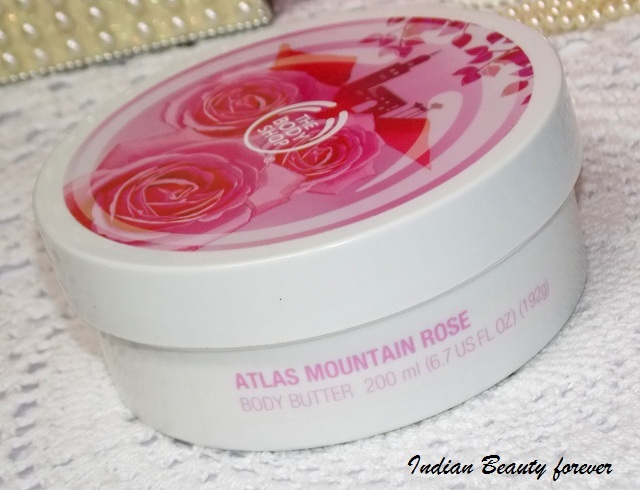 The Body Shop Atlas Mountain Rose Body Butter will soften your skin with 24-hour moisturization infused with precious oil from hand-picked roses. Moroccan rose extracts moisturize and sooth skin with a fresh, floral scent. Community Fair Trade shea butter leaves skin soft, smooth and supple. Community Fair Trade babassu oil helps repair skin's moisture barrier while restoring suppleness. Best for normal/dry skin. 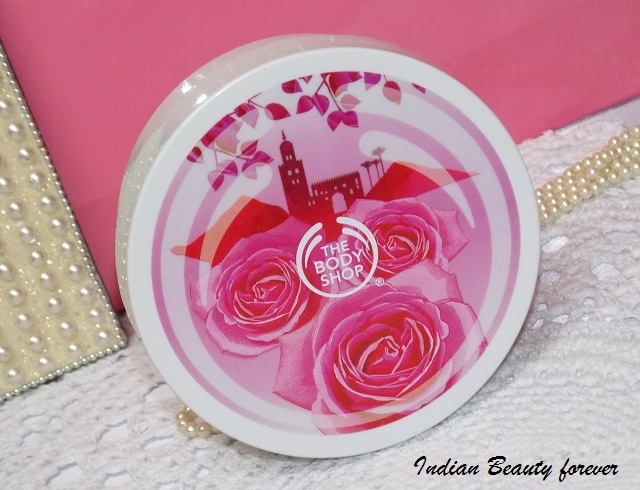 Views: The Body Shop Mountain Rose Body butter comes in a bulky tub, inside which there is a thick cream which exudes a pleasant rose fragrance that stays on for around one and a half hour on me. 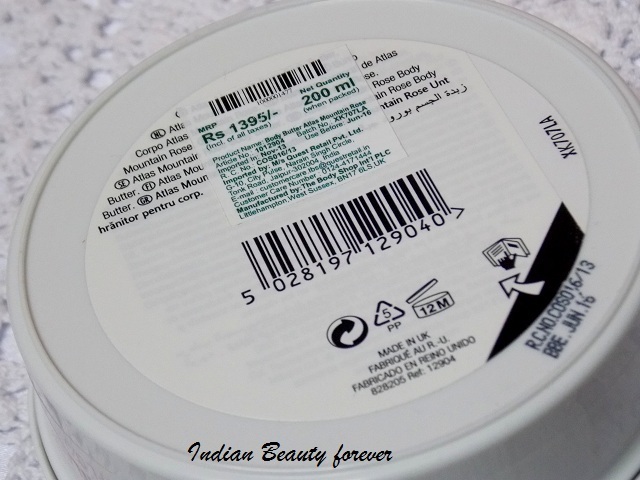 It is very moisturizing and hydrating to the extent that when I used that during the winters, it really did a good job for my normal body skin. I need not to apply anything or reapply for the entire day. But now that it’s summers, weather is getting hot, it can make my skin a bit greasy. At the same time, it can fare really good for dry skin since dry skin need a lot more moisture than the normal skin and can get itchy and flaky! Once I apply it in the morning it will combat dryness the entire day and for my mum who has very dry skin it can do the same for more than 9 hours, before she actually needs to reapply it! Body butters in general, have this thick consistency and minimum water content that makes them better at providing moisture than the regular body lotions, moreover their fragrance lingers a lot longer and the same can be the reason for their higher price from the counterpart lotions! I am already testing The Body Shop Strawberry body butter which isn’t as greasy, just pefect for my skin in this hot weather. Stay tuned review will be up soon! Keeps skin moisturized for upto 9 hours or the entire day which depends on the skin type. 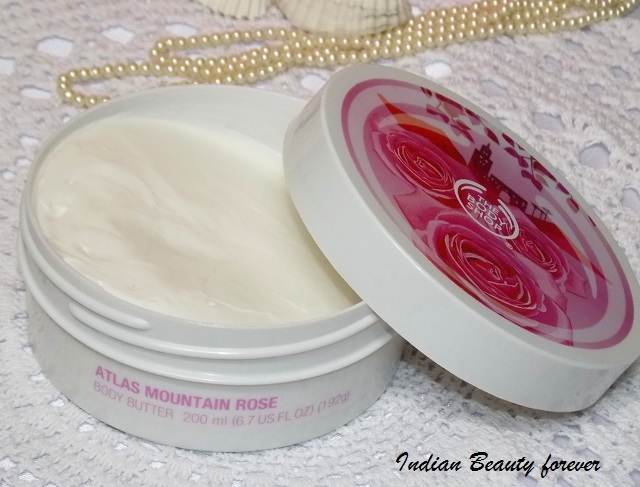 Take: The Body Shop Atlas Mountain body butter hydrates and keeps the skin softer with no dryness. Its pleasant rose fragrance lingers a lot longer than the body lotions. The time it will hydrate the skin may vary according to the skin type though even for dry skin it hydrates for 8-9 plus hours which can be considered good!